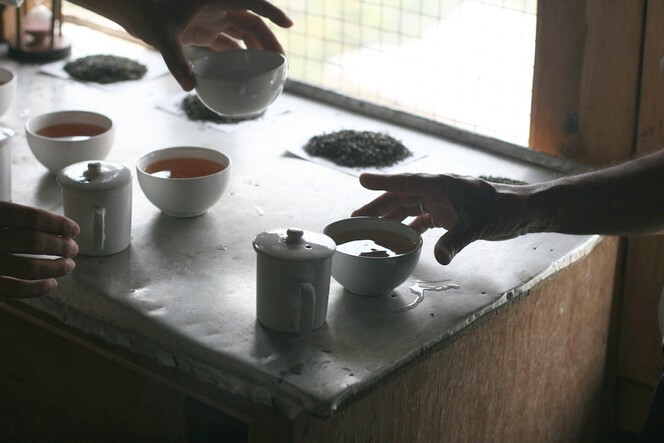 Tea tasting is a special moment for me. While we wait for the teas to infuse, we talk, or we look at the dry leaves. Then, when the tea is ready, we exchange cups, without a sound. We inhale the aromas of the leaves, look at the liquor, and taste it. Then we compare it with the cup beside it. It is a moment of pleasure and of concentration. Hand movements are precise and slow. To me, this serenity is important in order to appreciate all the pleasures offered by a cup of tea.